NYC, 04/03/2019, 5:00PM. 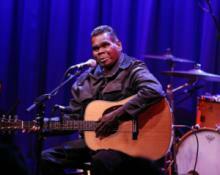 Gurrumul (2017): Blind, Aboriginal Musician. Born blind, the late Indigenous Australian musician and Yolngu elder Gurrumul Yunupingu was celebrated at home and abroad, straddling Aboriginal and global worlds in this extraordinary documentary chronicling his life.